September Newsletter: Celebrating "Mid-Continent Oceanographic Institute Day"! September has been quite the whirlwind as we settle into our new home, but this week alone may go down as the most exciting in the history of our organization. On Tuesday, September 25, we celebrated the grand opening of the Writers’ Room at South High School. 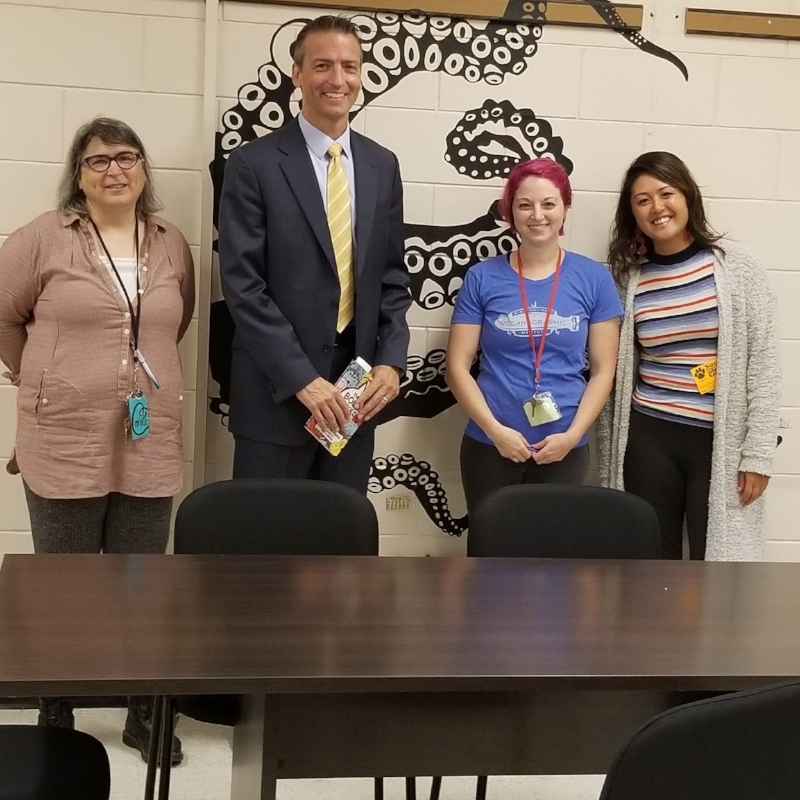 All day, groups of students came into the room to engage in creative writing activities, and we even got a special visit from Minneapolis superintendent Ed Graff. On Wednesday, we had our Open House at our new headquarters in Minneapolis, and the mayor declared September 26 “Mid-Continent Oceanographic Institute Day” in celebration. Visitors to the Open House had a chance to see our brand-new writing lab and oceanographic storefront—and got to witness the painting of a sea-themed mural on the outside of our building. A proclamation from the mayor is great, but nothing beats seeing our young authors delight in the new spaces we have built for them with the generous support of our community. Thank you! We're back! MOI Programs are up and running starting October 1, and we need all hands on deck. Come in for a 90-minute volunteer orientation, and then jump right in with our creative writing and academic support programs! 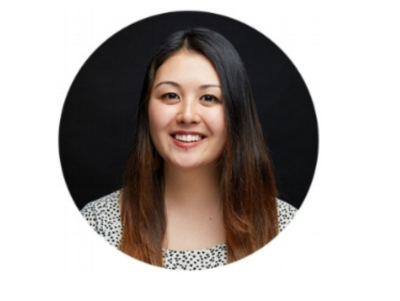 October 1: After-School Homework Help starts, running every Monday-Thursday from 3-6pm. October 10: We host our first Storytelling & Bookmaking field trip of 2nd-4th grade students in our new space. October 16: We head into the classroom at South High for our 4th year of the Young Authors' Book Project with South High 9th and 10th graders. 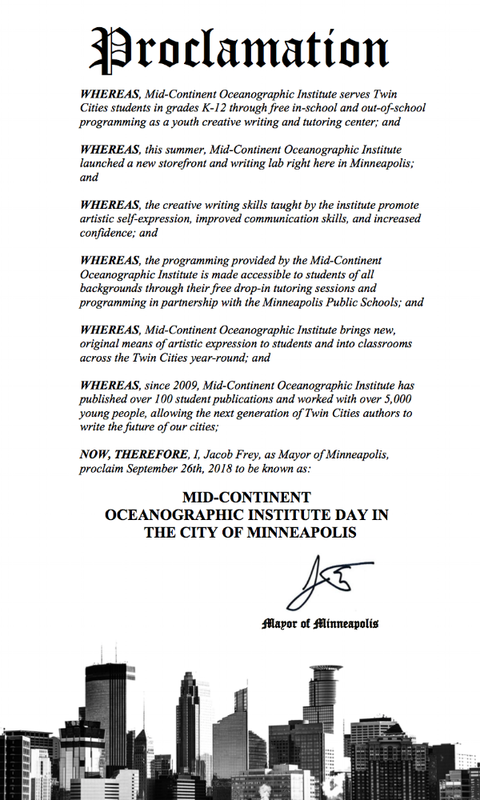 September 26, 2018 was officially named "Mid-Continent Oceanographic Institute Day" by the city of Minneapolis. Do you love MOI and want to help us write the next chapter for our organization? Apply today to be an MOI board member! Board members meet quarterly and support our organization with strategic planning, fundraising, and financial oversight. To learn more, email board chair Kathy Thomforde at boardchair@moi-msp.org. and I felt free at last.